Hi there, long time subscriber. I have a recipe I have been looking and looking for with no luck. I made these cookies back in the 1980’s and lost it in a fire in the 90’s. It is a strawberry cookie. I used real strawberries with orange juice, flour and Not sure what else. No cake mix was used. I miss this cookie and am sure my family now would love to eat them too. Forget where I got it, but it might have been Prevention, or Organic Gardening or Backwoods Home mags. Hoping someone liked them like I did and still has the recipe somewhere out there in internet land. Thank you for offering this help. Appreciate all you do and glad you were ok with all the weather lately. Feel for all that lost their life and those that lost their property. I have a recipe that I got from a college friend years ago. It sounds like the one you are looking for. I used to make these on Sundays so we could have them with afternoon coffee. I haven’t made them in years. Thanks so much for reminding me about them. I hope this is the recipe (or close to the recipe) you’re looking for. Preheat the oven to 325F. My oven runs a little on the cool side, so I actually set it to 335 or 340F. Cream the butter and guar in a medium bowl. Add the jam, egg and juice and mix. Mix the baking powder into the flour, then add the flour mixture to the batter. The dough will seem a bit dry at first, but the chopped berries will add some more moisture. Fold in the strawberries and and drop the spoon fulls on a lined cookie sheet. These cookies will spread a little but not very much. Leaving about an inch of space between cookies will do the trick. Bake them for 15 minutes or until they are lightly brown. Allow the cookies to cool a bit before removing them from the cookie sheet. Allow them to cool completely on a wire rack before storing them in an air-tight container. 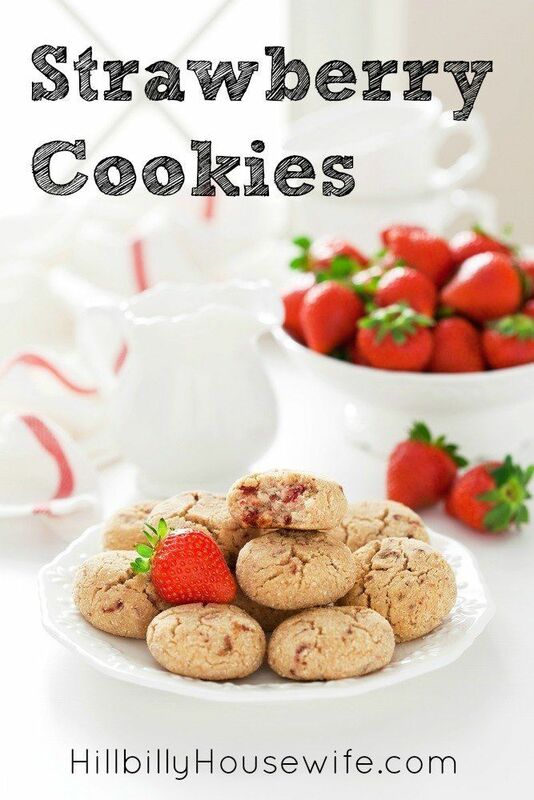 Does anyone else have a strawberry cookie recipe to share?